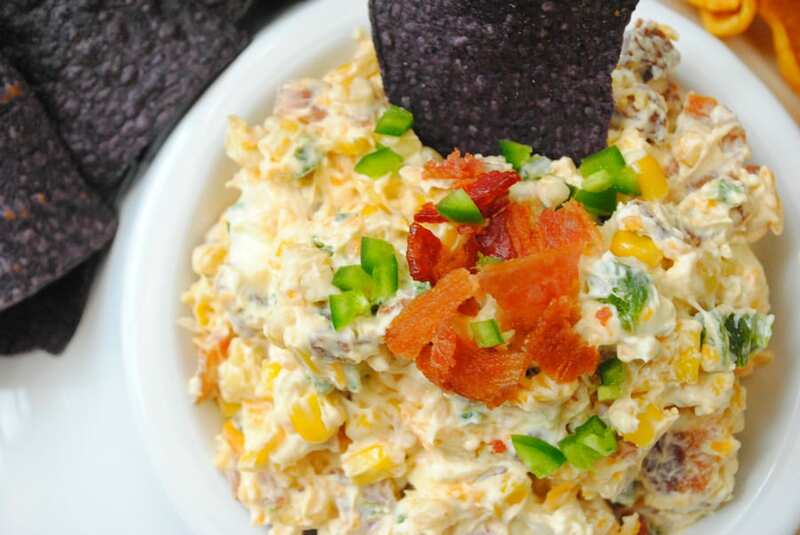 This Million Dollar Tailgating Dip is SO good. It’s everything a good tailgating dip should be; warm gooey cheese, smokey meats, spicy kick from jalapeños and eaten with corn chips. Every now and again it’s nice to partake in something so delicious and to serve it for friends who can share in it’s deliciousness with you. I’ve lately been on a smoked chorizo kick. In a soon to come post, I have been using the chorizo with corn, jalapeños and lime juice to make a sauce over some fresh grilled fish. In making that slurry of goodness I realized it would also be delicious with cheese as a dip. So this Million Dollar Tailgating Dip was born. We love spicy things here so I use 2 jalapeños and leave some seeds and ribs in. But if you don’t like spicy then just use one jalapeño and make sure to remove all the seeds and ribs. The cream cheese and cheddar cut down on the spiciness of the pepper. It won’t be too much heat I promise. Bacon and Chorizo are both used in this bad boy to amp up the smokey meat flavor. Yes, yes, yes! It’s beyond. I think those two combined is why I’m calling it Million Dollar Tailgating Dip. It’s just worth every stinking calorie. So whether you like to tailgate watching football, soccer, hockey, or basketball you have something new and interesting to bring with you or serve at your place for friends. Enjoy and I hope your team wins!! In a frying pan over medium heat, heat up the olive oil. Add in the sausage and cook for 2 minutes until just beginning to brown. Toss in the jalapeño and corn kernels and mix with the chorizo. Cook for an additional two minutes. In a bowl combine the softened cream cheese, cheddar cheese, cooked bacon, and the chorizo corn mixture. Stir together while warm. Put into a bowl to serve with corn chips. I like to top mine with additional bacon pieces and jalapeño.